A few weeks ago, I critiqued several articles that attacked “myths” about Customer Data Platforms. But, on reflection, those authors had it right: it’s important to address misunderstandings that have grown as the category gains exposure. So here's my own list of CDP myths and realities. Reality: CDPs vary widely. In fact, most observers recognize this variation and quite a few consider it a failing. 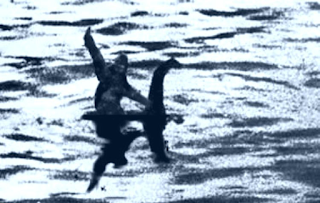 So perhaps the real myth is that CDPs should be the same. It’s true that the variation causes confusion and means buyers must work hard to ensure they purchase a system that fits their needs. But buyers need to match systems to their needs in every category, including those where features are mostly similar. Reality: This is the opposite of the previous myth but grows from the same underlying complaint about CDP variation. It’s also false: CDPs all do share core characteristics. They’re packaged software; they ingest and retain detailed data from all sources; they combine this data into a complete view of each customer; they update this view over time; and they expose the view to other systems. This list excludes many products from the CDP category that share some but not all of these features. But it doesn’t exclude products that share all these features and add some other ones. These additional features, such as segmentation, data analysis, predictive models, and message selection, account for most of the variation among CDP systems. Complaining that these mean CDPs are not a coherent category is like complaining that automobiles are not a category because they have different engine types, body styles, driving performance, and seating capacities. Those differences make them suitable for different purposes but they still share the same core features that distinguish a car from a truck, tractor, or airplane. 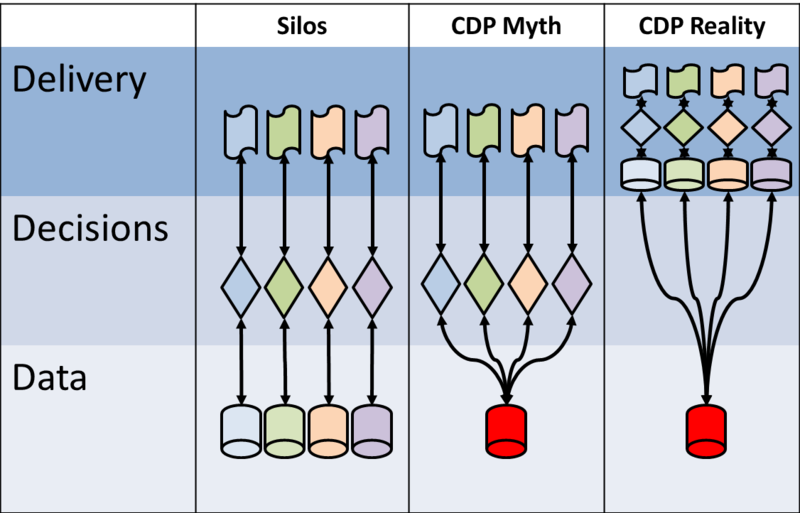 Myth: CDP is a new technology. Reality: CDPs use modern technologies, such as NoSQL databases and API connectors. But so do other systems. What’s different about CDP is that it combines those technologies in prebuilt systems, rather than requiring technical experts to assemble them from scratch. Having packaged software to build a unified, sharable customer database is precisely the change that led to naming CDP as a distinct category in 2013. Reality: They sure do, but not as much. At a minimum, CDPs need corporate IT to provide access to corporate systems to acquire data and to read the CDP database. In practice, corporate IT is also often involved in managing the CDP itself. (This recent Relevancy Group study put corporate IT participation at 49%.) But the packaged nature of CDPs means they take less technical effort to maintain than custom systems and many CDPs provide interfaces that empower business users to do more for themselves. Some CDP vendors have set their goal as complete business user self-service but I haven’t seen anyone deliver on this and suspect they never will. Reality: It’s clear that departments outside of marketing can benefit from unified customer data and there’s nothing inherent in CDP technology that limits them to marketing applications. But it’s also true that most CDPs so far have been purchased by marketers and have been connected primarily to marketing systems. The optional features mentioned previously – segmentation, analytics, message selection, etc. – are often marketing-specific. But CDPs with those features must still be able to share their data outside of marketing or they wouldn’t be CDPs. Myth: CDPs manage only first party, identified data. Reality: First party, identified data is the primary type of information stored in a CDP and it’s something that other systems (notably Data Management Platforms) often handle poorly or not at all. But nothing prevents a CDP from storing third party and/or anonymous data, and some CDPs certainly do. Indeed, CDPs commonly store anonymous first party data, such as Web site visitor profiles, which will later be converted into identified data when a customer reveals herself. The kernel of truth inside this myth is that few companies would use a CDP to store anonymous, third party data by itself. Reality: Many CDP systems provide built-in identity resolution (i.e., ability to link different identifiers that relate to the same person). But many others do not. This is by far the most counter-intuitive CDP reality, since it seems obvious that a system which builds a unified customer profiles should be able to connect data from different sources. But quite a few CDP buyers don’t need this feature, either because they get data from a single source system (e.g., ecommerce or publishing), because their company has existing systems to assemble identities (common in financial services), or because they rely on external matching systems (frequent in retail and business marketing). What nearly all CDPs do have is the ability to retain links over time, so unified profiles can be stitched together as new identifiers are connected to each customer’s master ID. One way to think about this is: the function of identity resolution is essential for building a unified customer database, but the feature may be part of a CDP or something else. Myth: CDPs are not needed if there’s an Enterprise Data Warehouse. Reality: It’s a reasonable simplification to describe a CDP as packaged software that builds a customer-centric Data Warehouse. But a Data Warehouse is almost always limited to highly structured data stored in a relational database. CDPs typically include large amounts of semi-structured and unstructured data in a NoSQL data store. Relational technology means changing a Data Warehouse is usually a complex, time-consuming project requiring advanced technical skill. Pushing data into a CDP is much easier, although some additional work may later be required to make it usable. Even companies with an existing Data Warehouse often find a CDP offers new capabilities, flexibility, and lower operating costs that make it a worthwhile investment. 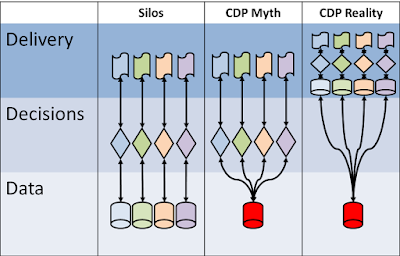 Reality: Mea culpa: I’ve often explained CDPs by showing separate silo databases replaced by a single shared CDP. But that’s an oversimplification to get across the concept. There are a handful of situations where a delivery system will read CDP data directly, such as injecting CDP-selected messages into a Web page or exposing customer profile details to a call center agent. But in most cases the CDP will synchronize its data with the delivery system’s existing database. This is inevitable: the delivery systems are tightly integrated products with databases optimized for their purpose. The value of the CDP comes from feeding better data into the delivery system database, not from replacing it altogether. Myth: CDP value depends on connecting all systems. 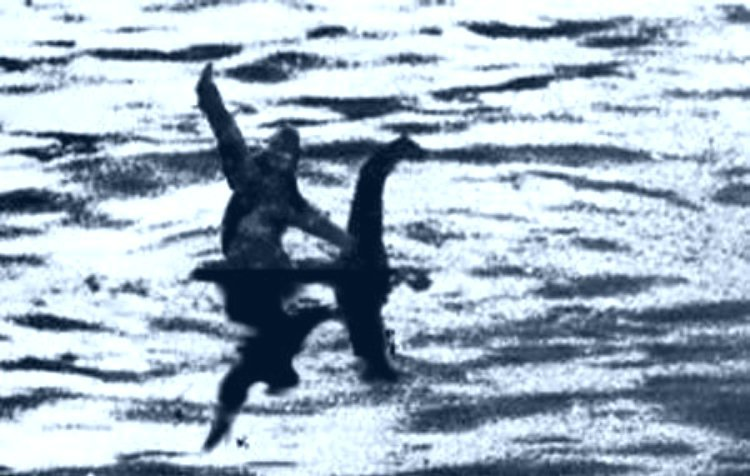 Reality: CDPs can deliver great value if they connect just some systems, or sometimes even if they only expose data from a single system that was otherwise inaccessible. This matters because connecting all of a company's systems can be a huge project or even impossible if some systems are not built to integrate with others. This shouldn't be used as an argument against CDP deployment so long as a less comprehensive implementation will still provide real value. Myth: The purpose of CDP is to coordinate customer experience across all channels. Reality: That's one goal and perhaps the ultimate. But there are many other, simpler applications a CDP makes possible, such as better analytics and more accurate data shared with delivery systems. In practice, most CDP users will start with these simpler applications and add the more demanding ones over time. Myth: The CDP is a silver bullet that solves all customer data problems. Reality: There are plenty of problems beyond the CDP's control, such as the quality of input data and limits on execution systems. Moreover, the CDP is just a technology and many obstacles are organizational and procedural, such as cooperation between departments, staff skills, regulatory constraints, and reward systems. What a CDP will do is expose some obstacles that were formerly hidden by the technical difficulty of attempting the tasks they obstruct. Identifying the problems isn't a solution but it's a first step towards finding one. Of course, everyone knows there are no silver bullets but there's always that tiny spark of hope that one will appear. I hesitate to quench that spark because it's one of the reasons people try new things, CDPs included. But I think the idea of CDPs is now well enough established for marketers to absorb a more nuanced view of how they work without losing sight of their fundamental value. Gradual deflation of expectations is preferable to a sudden collapse. Let's hope a more realistic understanding of CDPs will ultimately lead to better results for everyone involved.